It’s really hard to take a photo of the top of your own head. I really enjoyed this pattern. I’ve been knitting scarves recently and I’d forgotten how quickly hats knit. I was surprised when I looked down and was already on the decrease rounds. The pattern is fairly simple. Mostly knit, pearl and yarn overs. The one new stitch I hadn’t done before was the Slip-Slip-Knit (SSK). Knitting Help.com has a great video to show you how to do this decrease. Not a stitch exactly, but (k1, p1) in yo was also new to me. When you get to the YO, K1, then don’t slip the stitch off of the needle and purl one in the same stitch where you knitted one, then pull both stitches off of the needle and onto the other. The double yo (from the previous row) leaves 2 loops on the needle. When you get to them on the next row, knit into the first loop, pearl into the other one. You may have to hold the 2nd loop with your finger while you knit into the first one so the don’t both drop off. Purl the next stitch. This is the stitch that makes the pretty twist that you see in the spaces. I like this hat. Its got enough of a slouch that I can be wearing a medium/low ponytail and still be able to pull this hat over it without having a weird lump in the back of my head. The band is tight enough that it stays on while the body is loose enough that it doesn’t smash my hair. The first time I used this pattern I was knitting Christmas presents for my future in-laws. I wanted to do something really impressive for my Mother-in-Law and Sister-in-Law… something pretty and girly. I actually ended up knitting my Mother-in-Law’s scarf twice… I was almost done with it when I learned that she was allergic to wool….. so I started over. I guess we could just call the first scarf practice? The original scarf went to my cousin, I gave the second scarf to my Mother-in-Law and later I decided that I wanted one for myself. It took me a while to figure out where I found this pattern. I think the author changed her blog…. I seem to remember the story that went with the patten name being something about the tv show CSI (which I was hooked on at the time too) and how she was able to get this scarf finished in the time it took her to watch two episodes of CSI (which featured this really cute character named Warrick)…. Either I misunderstood, or she knits WAY faster than I do! The original post is gone, but the Ravelry link credits this lady. It’s a super easy pattern. Just four repeating rows and only one row actually requires you to pay attention. Maybe she could get it done in two episodes of CSI…. One note: I mess this up every time and I have to start over…. it’s easy… but I always miss it. “Stitches 1 and 26 are selvedge stitches; the pattern is worked over 24 stitches.” That means you knit the first and last stitches. Sounds easy, right…. but I always forget to do that on the 2nd and 3rd rows! Remember that the pearl row needs to start and end with the knit too. She says that in the directions twice….. I still screw it up. Maybe if I say it a few times it’ll be burned into your brain. I used two skeins of SWTC Yarn’s Karoke: Cherry Cola (aprox 200 yards). We’re starting to plan our vacations for the year, so I’m knitting scarves. Yeah…. that sounded weird to me too. My cousin, Shani has lived and worked in Yellowstone National Park for the past few years and she’s been driving me mad with the amazing photos that she posts. After whining relentlessly rationally presenting my argument, Brian has relented and agreed to bump Yellowstone up on our Must See list. Yay! I messaged Shani right away and started asking where to stay and what to see and the best way to get from here to there. Two dozen txts in Brian tells me to ask her if she thinks we could take the convertible or might there still be snow on the road and would the SUV be better…. Huh? Snooow? It just hadn’t occurred to me…. yes, yes… I know we’ll be going through the mountains…. but…. In my defense, this is my first trip north. All my vacations have been to the south… or somewhere tropical (except for that one horrible trip to Alaska.) In my head Vacation = Hot. I’ve been wanting to knit a new scarf for Brian for a while now, but I couldn’t find a pattern that didn’t seem boring or girly. Then I remembered the Ameeta Scarf. 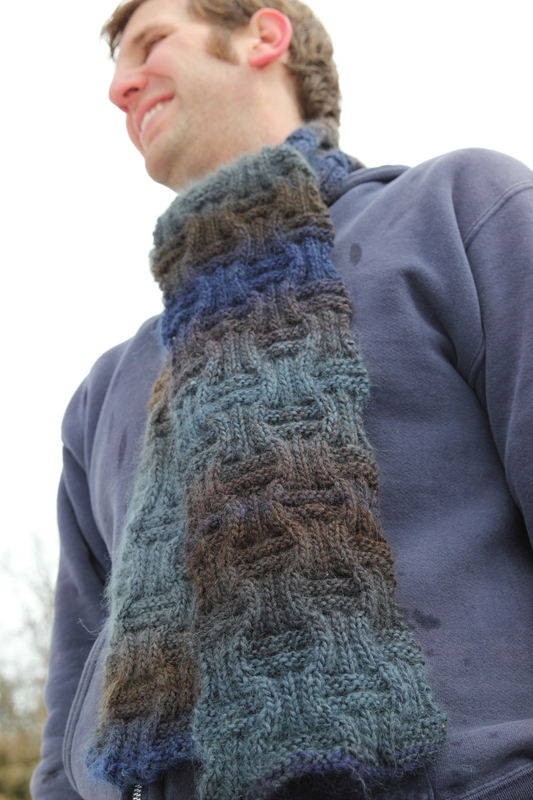 I’ve knitted this pattern once before and I don’t usually like to knit the same pattern twice…. I’m still learning, so I like to add some new technique with each project….. but I really liked this pattern. It’s super easy, just knit and pearl. You do have to actually read the pattern… it’s not one that you can memorize and just knit, but it’s not complicated. So just to make myself feel like I was adding/learning something new I decided to make sure I had no transition lines when changing balls of yarn. I know that’s not a super fancy technique, but since I was using a striped yarn (and I hate the transition line) I unwound the ball of yarn until I got to the matching color and made the change to the new ball of yarn. I had to do that twice since I ended up basically cutting the second ball of yarn in half to find the color. No transition line… Yay! I used two skeins of Universal Yarn’s Cedar Forest (Aprox. 400 yards). 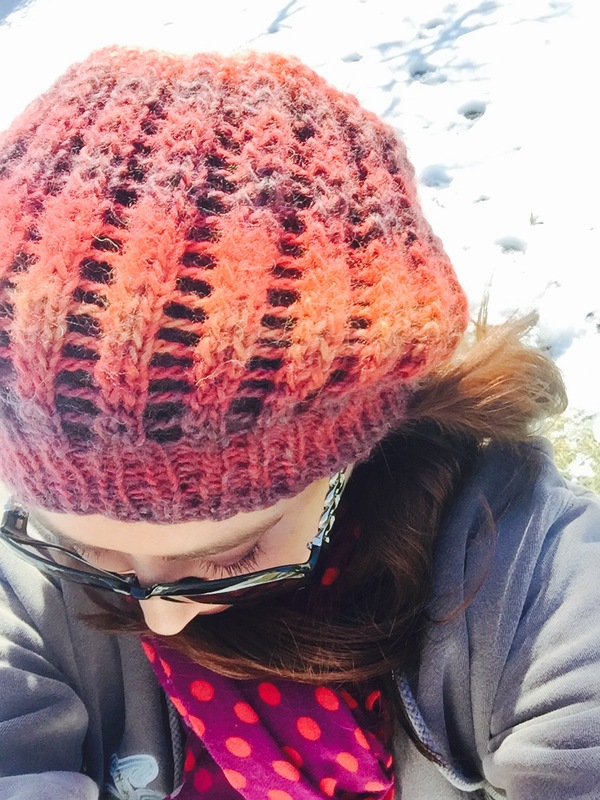 My current obsession is knitting scarves and hats… in between stamping and scrap-booking and baking and blogging and… okay, so I am kind of scatterbrained with my obsessions! At any rate, I have found so many wonderful patterns online and on blogs like mine (yeah, they were probably WAY more organized) and I thought it would be nice to return the favor of a free pattern…. good knitting karma! Mom and I have really been enjoying playing with this pattern lately. We’ve warped it quite a bit from the original which is what I’m sharing here. 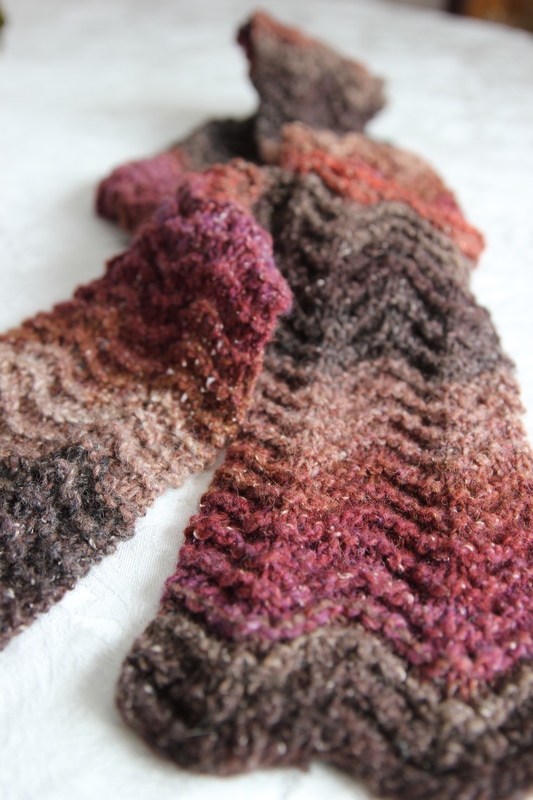 The original pattern Potato Chip Scarf from KnitPicks was great, but I didn’t like having to use the big needles and the length was crazy! It was twelve feet! The great thing about most scarves is that you don’t have to be too fussy about gauge and using just the right needle size… scarves are forgiving! Mom and I have added a couple of extra rows to the original pattern since we prefer to use the smaller needles. Mom has been making theses in bright colors from Caron Simply Soft and I have plans for a red and white ruffle made from some Simply Soft and a sparkly white yarn I found in the bottom of my knitting basket. Row 2: Knit in front and back of each stitch. Row 3 , 4 & 5: Knit. Row 6: Knit in front and back of each stitch. Row 7, 8 & 9: Knit. Row 10: Knit in front and back of each stitch.